During the April Commission Meeting, The Florida Fish and Wildlife Conservation Commission (FWC) approved a 78-day recreational Red Snapper season in Florida State Waters that begins each Saturday and Sunday in May 2017. That makes the first day of the recreational season May 6th this year. Beginning May 27th, red snapper can be fished daily through July 9th in State of Florida Waters. The season will also allow fishing every Friday, Saturday and Sunday in September and October, including Labor Day. Other rules anglers should keep in mind that there is a 2 per person each day bag limit with a 10 per harvester per day bag limit (Charter Captains and crew limit is zero). Also, each fish must be a minimum of 16” TL. These limits are in place to ensure a sustainable red snapper population. The Federal Regulations have also been announced by the National Oceanic and Atmospheric Administration (NOAA) and the Federal Waters recreational season will begin June 1st and end June 3rd for recreational fisherman from privately owned boats. This will be the shortest season ever for federal waters. Federally permitted charter operations (For-hire Components) season will allow a total of a 49-day season beginning June 1st and ending July 19th. The short recreational season is being blamed on overfishing which occurred in 2016, which NOAA reports exceeded the limits by 129,906 pounds. Bring your Family and friends out for a day on the water chasing down a beautiful red snapper for yourself. 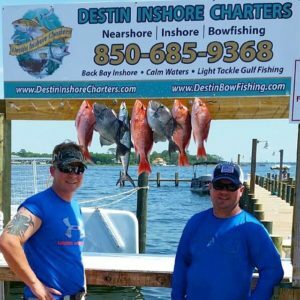 Book your charter today with Destin Inshore Charter or Destin Offshore Charters by calling (850) 685-9368. Captain Chris Kirby, Shelby and the entire team will make sure that you have a great experience. This recipe is perfect for a barbecue! Also, if you don’t have a way to smoke your fish a little secret that we use is grilled fish with a little liquid smoke added to it. That will give you the smoky flavor without all the work. Original Wheat Thins and Ritz crackers are our favorite. With a fork, break up fish into shredded chunks in big bowl. Combine all ingredients along with fish in bowl. Mix thoroughly. Be careful not to mix too much and turn the dip to mush. Serve with any crackers of your liking! This recipe is a little more effort but worth every second! This is Chris’ favorite!! Triggerfish and Grouper are our favorite fish to prepare this way. Also, you might want to do this outside, it does sizzle and smoke quite a bit while the fish is cooking. Using a grill works great. Prep fish. Cut out all bloodline and trim up in a nice filet, fit for a sandwich. No thicker than ¾ in. Get skillet hot. 350-400 degrees is ideal. While skillet is getting hot, dip each filet into melted butter and then top your fish with blackening seasoning and flip over and also coat the bottom side. Do this to all filets. Once skillet is hot, place one filet at a time on hot skillet. Cook on each side for 2 minutes. Repeat until all filets are cooked. Make slaw. Add all ingredients into bowl and mix together. For a little extra touch, toast your buns. Top bun with fresh slaw, tartar and a blackened filet. Serve with a side of chips or fresh fries! Hard to beat a simply southern fried fish! Chris and I cook fish at least once a week and it usually is prepared this way! Our favorite species to make this way include: Flounder, Gag Grouper, Flathead Catfish, Scamp Grouper, Mingo (Vermillion Snapper) and White Snapper. And of course your fish! Prep your fish! Cut all the bloodline out. Cut into 2 x 2in chunks. Throw fish chunks in bowl and top and toss in Italian dressing. You need just enough to cover the fish thoroughly. Set aside. Toss marinated fish chunks into gallon bag and shake it up! Check oil temperature and once it has hit 350 degrees you are ready to cook. Place fish chunks individually, not touching one another in oil. Rotate accordingly and cook until golden brown. Pull out and place on paper towels to drain excess grease off. Serve with your favorite cocktail sauce, fresh cut fries and cold beer! This recipe is for about 3lbs of fish and feeds 6 people. If you have more fish then that and need to feed a tribe, then just double recipe. Enjoy! Catch and releasing big bull redfish on light tackle one after another, never gets old! When you enter into a mackerel rally you never know what will happen. This crew left with lots to take home for dinner! These boys reeled their arms off fighting these Red Snappers and King Mackerel. As they were leaving the dock they said, “That was the best fishing day we have ever had!” That is what its all about! As we look back at 2016, we want to say THANK YOU to ALL those who fish aboard the Adios and the Amigo here at Destin Inshore Charters. We are very thankful for your time and look forward to taking y’all out again soon! Whether we were catching Red Snappers or Red Fish, we were able to share lots of memories and feed a lot of mouths. It just doesn’t get any better then that! Hope to see everyone back in 2017!! The Fudpucker’s Bottom Feeder Fishing Tournament is an 8 day tournament open to all anglers wanting to test their skills with Amberjack, Grouper and Red Snapper. The Tournament offers awesome cash prizes and more! Captains Meeting: 7PM September 2nd, 2016 at Fudpucker’s on the Bay (1318 Miracle Strip Parkway) All Captains must attend. Fishing Date: Saturday September 3rd – 10th, 2016 – Scales open at 4PM and close at 6PM. 100% of the proceeds from the Raffle will benefit the Choctawhatchee Basin Alliance. For more information, check out Fudpuckers Fishing Series. 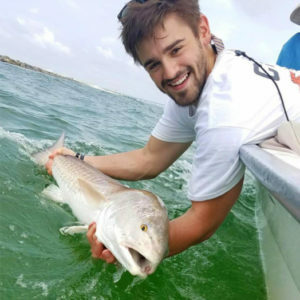 One of the more popular fish you’re likely to catch if you join us here at Destin Inshore Charters this month is the populous and readily-caught red drum. Known as the channel bass, spot-tail bass, bull red, puppy drum or just plain reds, the red drum is a fish of many names. However, it is most commonly referred to by locals in the Destin and Panama City area as the red fish. 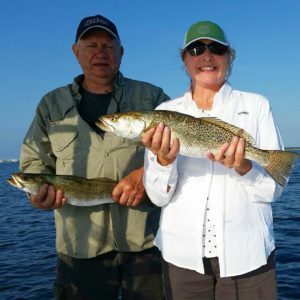 Located on the Choctawhatchee Bay, we usually find our reds in the shallow grass flats and points and baited with our light tackle, live shrimp on popping corks and on-slip leads. 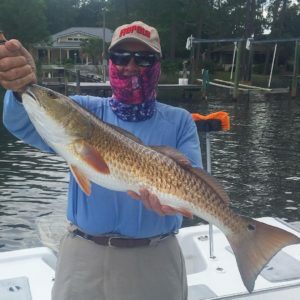 Widespread in its range, the availability of the redfish (found anywhere in the coastal area of the southeast where the food is plenty) is what makes it one of the most popular and easy fish to catch for even a beginner fisherman. Named after the “drumming” sound they make when taken out of the water, red fish caught in Florida have been found to reach lengths of 45 inches and can weigh as much as 51 pounds. The world record held for the largest red drum was caught off of the coast of North Carolina in 1984 and weighed almost 94 pounds! 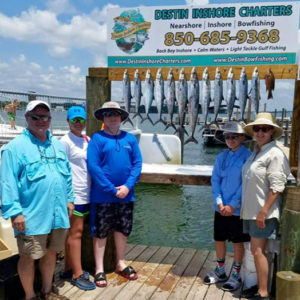 Kids are going from over-stuffed backpacks and piles of homework to fun with the family at the beach or the lake―as school cools down and comes to an end, the water here at Destin Inshore Charters is just warming up (literally). With an average high of eighty-seven degrees in June, what better place is there to get a little sun and first fishing experience than over here with our helpful and enthusiastic staff? This time of the year sees a big rise in the catching of redfish and black snappers and, even though rarer for these hotter temperatures, the occasional flounder finds its way over to our inshore fishing charters located directly on the Choctawhatchee Bay. So come on over and let’s give those kids a well-needed reward for working so hard during the school year―join us on our newly-offered Inshore Bay-Kid Trips! Estimated to be about two to three hours in length, the purpose of these trips is to get the kids familiarized with not only the idea of fishing and catching fish on the seaside such as the redfish, speckled trout, black drum, or red or black snappers, but also with the feeling of being on a boat (and getting over that initial seasickness!) and how to handle hooking that first catch! Our highly qualified staff is eager to help educate and familiarize your children (and even you, if you need a little refresher!) with the redfish, black snappers, and flounders and how to best and safely catch them. So slap on a bunch of sunblock and come on over to enjoy the warmer waters with the fish. Go ahead and book your appointment soon, as spots fill up quickly. Let’s start the summer right! With June comes the official start of Summer. 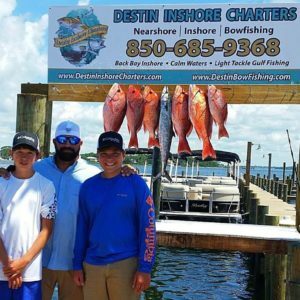 The kids are out of school, the water is perfect, and we at Destin Inshore Charters are in full swing! Summer is the perfect time to create some family memories and document all of your adventures. Today we will showcase a few pictures from May that we’ve shared on our Instagram and Facebook. Document your fun in the sun this summer. Follow us on Instagram, Like our Facebook page and tag us in your pictures. We’re ready to double-tap your catches! Water temperatures are on the rise as we enter the month of May, giving hope to many anglers that this spring season will be one for the books. Temperatures have been on a steady increase this past week, hovering around sixty degrees―and as a result―the fish are definitely biting up a storm! The past few years have not been very kind to us fisherman, the temperatures shooting up before the lure even has a chance to break the water’s surface. But if those ocean waters continue this gradual warm up, it could mean a very active and rewarding month of fishing for all of us. In the smaller scope of inshore fishing, we are seeing a substantial rise in flounder activity along the coast of Destin, with a significant increase in the number of reported keeper fish being caught in the past week alone. If you have never caught a flounder and it sounds intimidating, don’t worry about it! 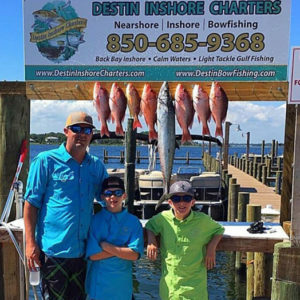 Here at Destin Inshore Charters, our knowledgeable and experienced crew has got you covered! We have the gear and the know how to help you reel in a lunker. Unlike many other types of fish, it is actually possible to track a flounder and follow their path almost as if you were hunting. Flounder usually tend to stay really close to the ocean floor, which disturbs the sand and causes it to billow up around the flounder as it moves. This makes it really easy for even the most casual fisherman to spot the distinct pattern and follow the tracks until eventually a flounder is found! Although finding a flounder and catching a flounder are two very different stories, these spoiled fish don’t respond much unless you are using live bait. That is why we are here. So come on down to Destin Inshore and tell us you want to catch your very first flounder, we will set you up and take you out along the coast on one of our two beautiful 25ft boats. If the waters warming up it means the air is warming up too, so bring plenty of water and plenty of sunblock. When you are out on the water, the shady spots are few and far between! Summer is coming up fast, so be sure to plan ahead and book your appointment early. The schedule is going to fill up quick. See y’all on the water! What type of fishing trip are you interested in?